I was hoping to wake up this morning and find that yesterday’s news about Sendak’s passing was only a dream. Back to the image above (pictured right is a detail of it) … One of my favorite things about blogging about picture books—if not my very favorite—is having the opportunity to chat with picture book creators. Sure, dialogue happens here at 7-Imp, but off-blog it happens, too — often before books get released. Today’s featured illustrator, Aaron Becker, is a case-in-point. And I happen to know Aaron was very inspired by Sendak, so as we mourn the loss of the master, we also look ahead to those whose work has been shaped by the breath of Sendak’s creative vision and his honesty. Aaron will visit 7-Imp later. His debut picture book won’t be released till next year (Candlewick), but he and I have chatted a bit, and once I saw his site at storybreathing.com, I fell for his artwork. Don’t you agree, dear readers? I think he is one to keep an eye on. 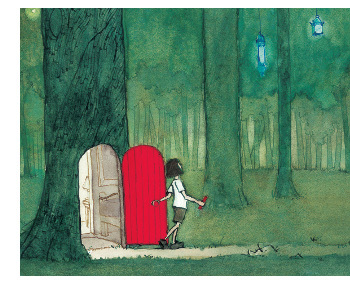 The image above is a sneak-peek at that upcoming picture book, which will be wordless, called Journey. It was rendered in ink, watercolor, and gouache. Aaron is also a film designer and, he tells me, is slowly making the transition to doing children’s books full-time. I very much look forward to discovering the story swirling around that magical image. Is it Fall 2013 yet? I am eager to see this book. At this link, you can see even more of Aaron’s artwork. Enjoy. Vicky Smith’s tribute over at Kirkus. Philip Nel’s touching post at Nine Kinds of Pie, which itself includes a round-up of links. Author/illustrator Sergio Ruzzier’s post on the same. The Horn Book’s round-up of Sendak coverage/interviews. Farida Dowler’s thoughts at Saints and Spinners. Laurel Snyder’s appreciation at The Jewish Daily Forward. Terry Gross’ coverage at NPR. … And so many more, I’m sure, that I’m missing. Again, be sure to visit Philip Nel’s post for even more links. The illustration in this post is © 2011 by Aaron Becker and used with permission. I do agree, his artwork is beautiful – just captivates me! Ooh. I’m loving this an awful lot. You know whose else’s work the character there reminds me of? Louis Darling – he of long ago Ramona fame. The short, straight, spiky hair, the body that leads with the torso, the pipe-stem arms and legs. Tanita: YES! And I covet the girl’s home (or what I assume is her home). Thanks Melissa. And Tanita- you are on the money with the Ramona look-a-like. I always loved that haircut! amazing color (red is my favorite). love the contrast. I’m so intrigued by that illustration, I just wanted to step right into the magic forest. Lovely color and light. Thanks for the peek. Wow–I want to do a book with him! The forest illustration really captivates. I’m really interested in seeing what’s inside her tree as well. This is one of the most breathtaking illustrations I’ve seen in a long time! I can hardly wait for this book. Thank you so much, Jules, for sharing it! Aaron’s picture is so lovely I want to walk into it and stay a while. Definitely looking forward to this book. Enchanted by this piece. (Love wasn’t a big enough word for this one.) Is there any way to follow you on facebook or twitter?